DISPLAY: 3-½ Digit, 7 Segment .56" Height; Red L.E.D. 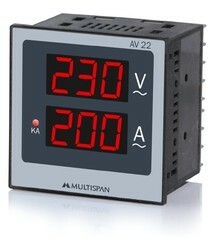 - 5 Line Ultra Bright Red LED display to show phase wise Parameters. - Site Programmable CT Ratio. 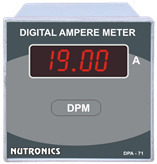 digital panel meter series of ac current, ac voltage & frequency. Encore series is a compact, digital, panel mounted range of meters for measurement of power and energy parameters. Encore, a three phase CT/ PT operated meter, is an ideal replacement for analogue ammeters and voltmeters. It provides advanced features for use in power transmission and distribution panels.